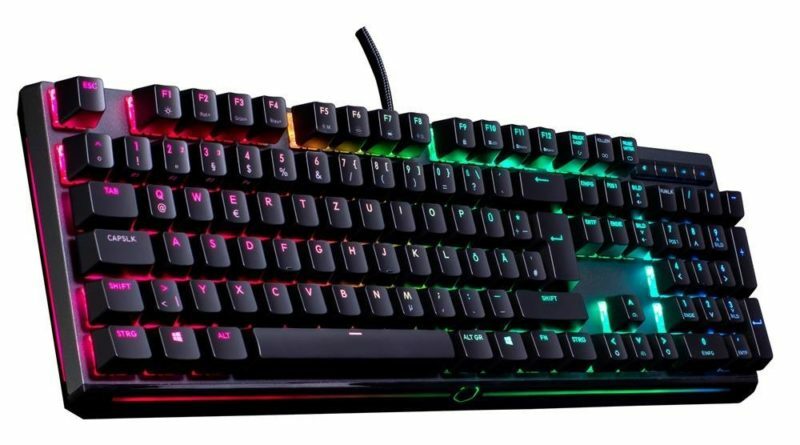 The CM MasterKeys MK750 is a mechanical keyboard with RGB illumination. The manufacturer Cooler Master first introduced it at the Computex 2017. The Cooler Master MasterKeys MK750 boasts a long list of features. It seems the manufacturer wanted to include as much in this model as possible. 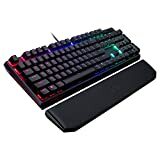 The keyboard is equipped with multimedia keys, a detachable wrist rest with magnetic docking mechanism, a detachable connector cable, and a cable management system on the keyboard’s underside. Aside from that, a keycap puller is enclosed alongside additional keycaps for the escape and the arrow keys as well as the letters W, A, S, and D. The keyboard’s casing made of cobalt-aluminum alloy gives it a high-quality look. A combination of n-key rollover and 6-key rollover is employed as anti-ghosting mechanism. Cooler Master promises that this makes sure each key stroke is correctly detected, regardless of how many keys are pressed simultaneously. Die CM MasterKeys MK750 supports complete RGB illumination und macro programming. Thanks to the on board memory, both features can be configured without any software, using shortcuts. If it’s more comfort that you crave, you can also download Cooler Master’s configuration portal on their website. Besides a range of colors, numerous lighting effects like “Breathing”, “Rainbow Wave”, “Ripple”, and “Crosshair” are at your disposal for configuration. Completed configurations can be stored under five available profiles, and thus quickly exchanged any time with one keystroke. Not only are all keys on the CM MasterKeys MK750 illuminated, there is also a lightbar on the front and both sides. The MK750 comes with the well-known MX switches by the German manufacturer Cherry. In general, blue, red, and brown switches are available. However, the range may be smaller depending on point of sale and keyboard layout. Not all options are offered in all regions. The keyboard’s model number indicates the incorporated switch: MK-750-GKCL1-** means Cherry MX Blue, MK-750-GKCM1-** means Cherry MX Brown, and MK-750-GKCR1-** means Cherry MX Red. The full-size keyboard MasterKeys Pro L is very much alike the MK750, although there are some minor differences in terms of design and equipment: As opposed to the MasterKeys Pro L, the MK750 has separate multimedia keys and an included wrist rest. In addition to that, the top cover was removed, the sides were equipped with RGB lightbars, and the on the fly configuration system of the illumination was slightly revised.